The terror attack shows bike lane opponents are "increasingly desparate," says Council Member Jimmy Van Bramer. 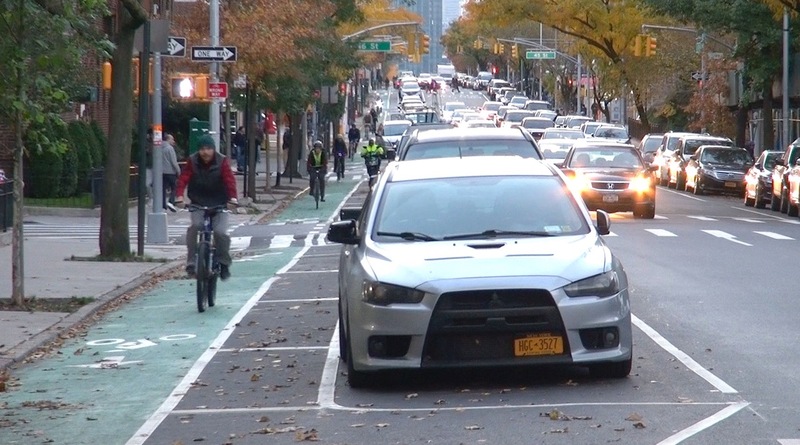 Queens bike lane opponents are resorting to vigilante tactics bordering on terrorism — and endangering people and families who use Sunnyside’s new protected bike lanes. Sunnyside parent Pete Shore was biking on 43rd Avenue with his kids on Wednesday when he ran over multiple thumbtacks strewn across the bike lane. On Thursday, Shore biked four blocks of the corridor and saw thumbtacks everywhere. It’s been more than three months since DOT installed protected bike lanes on Skillman and 43rd avenues, and they’ve been an unmitigated success, as Streetfilms’ Clarence Eckerson has documented. But opponents refuse to accept reality. Mayor de Blasio and local Council Member Jimmy Van Bramer have said the bike lanes are here to stay, but opponents continue to spew bogus concerns about emergency vehicle access and pedestrian safety — all of which have been debunked by public officials. The 43rd Avenue protected bike lane in action. Video still: Clarence Eckerson, Jr.
Streetsblog was unable to reach Shore. In a comment on his original post, he said he preferred not to involved the police, and that he hoped that his experience would inspire a less vitriolic approach from bike lane opponents. “If you are in opposition to the bike lanes, then petition the city, start a campaign, do whatever you want, but please, do not take actions that can actually physically harm me, my kids and, for all you know, someone in opposition of the bike lanes,” he wrote. Unfortunately, it’s not surprising to see bike lane opponents resorting to dangerous vigilantism. In response to Shore’s post, bike lane opponents condemned the thumbtack attack. “Regardless of someone’s position this is disgusting and the individual(s) responsible need to know they can’t get away with this / do it again,” wrote Eric Barthels, a bike lane opponent who owns Cooldown Juice on Skillman. But Van Bramer pinned the deadly vigilantism on bike lane opponents. On his Facebook page, he argued that their vitriolic campaign against the project — and constant attacks on its supporters — had fostered hostility. “Little children have been placed in harm’s way because some will never come to accept that we have bike lanes in our community,” he added. We have received reports of thumbtacks being intentionally left in the bike lanes along 43rd Avenue in Sunnyside. This represents a new low and a violent and dangerous turn by those opposed to the bike lanes. Yesterday, a father from Sunnyside biking with his children had his tires blown out and they could have been seriously injured or worse. I regard this as a criminal act and we have asked the 108th Precinct to investigate it as such. Let me be clear: the bike lanes are not going away. I support them. And while people may disagree, the increasingly desperate campaign against them is now riling up the worst elements of our community and inspiring criminal vigilantism. No matter where you’ve stood on the bike lane debate, we should all be disgusted by how negative and now dangerous the opposition against them has become. Now little children have been placed in harm’s way because some will never come to accept that we have bike lanes in our community. Correct that this is vandalism. And people throwing stuff at cyclists from cars, which happened to me quite a few times, is assault. Someone could have been injured or killed due to this stunt. I’ve been riding on airless tires for close to a decade. Tacks aside, there are already lots of things which can potentially cause a flat. It’s peace of mind knowing when I go for a ride at least my bike won’t be out of commission due to a flat tire. Someone needs to inform these people that CYCLISTS HAVE NO CHOICE. Not all of us needed or wanted these lanes. But now that the lanes are there, we can’t just choose not to ride in them; we are legally obligated to ride in them. So putting tacks in the lanes serves no purpose other than to cause gratuitous property damage and injury. This is NOT a ‘vigilante’ stopping a bank robbery or something. Streetsblog, let me use this word for you. The *vigilante* observed a domestic terrorist dumping tacks into the bike lane, so they tackled the guy and detained him. Please cite the law that says you are required to use a bicycle lane. Good luck. NYS VTL Sec 1234 & NYC Rules–RCNY 4-12 (p) (3). Yes, I cheated. You, too can Google the NY Bicycling Coalition’s summary of bike-relevant traffic laws. Have a nice day. VTL § 1234 does not apply in NYC. I have zero faith the cops will do anything about this at all. Drivers literally intentionally run into cyclists. Even with witnesses the NYPD won’t take these incidents seriously. If we’re being honest, the police have an overtly hostile attitude toward cyclists. They are part of the problem. Unless they were lucky enough to have camera surveillance when the tacks were placed AND the person is identifiable in the picture I’d say they’re SOL. It would also be extremely difficult for the camera to pick up the tacks being dropped. The only other hope is someone who knows something comes forward. Thank you for using the correct word: terrorism. Suggest you read past the ampersand. If the lane is provided, a cyclist is legally required to use it. But don’t take my word for it. Wait for a cop to ticket you for riding outside the lane – because they will – and challenge it in court. Unless there is an obstruction, NYPD can fine you for not riding in the bike lane if one is provided. I have been fined on Central Park West for going outside of the bike lane to go around some tourists going 5mph on the lane. I have read mostly negative reviews of airless tires but you have stated many times that they work well for you. Are some brands of airless better than others? That’s lame. You took that one to court, I hope?! Obstructions are a valid reason to leave the lane. Keep in mind a lot of those reviews are written by sport cyclists who notice even a few tenths of an mph speed reduction. Also keep in mind flat-resistant tires, such as the Schwable Marathon, also have increased rolling resistance over regular tires. The key to making airless tires work is getting the correct hardness. One big difference between airless and pneumatic tires is how they react to additional weight. Regular tires seem to have a more or less linear increase in resistance with weight. If they have a resistance of 1 pound with 200 pounds of weight the resistance will increase to 1.5 pounds with 300 pounds of weight on them. Or put in engineering terms, the rolling coefficient remains the same regardless of weight. Airless tires seem to have an inflection point above which the rolling coefficient starts to increase. The harder the tire, the higher the weight at which this happens. A softer tire might be fine for a child or a small woman weighing under 100 pounds. A 200+ pound man will need the hardest grade tire to stay below that inflection point. So long as you select the right tire, the speed decrease over a pneumatic tire will be about 1 to 1.5 mph at most. For utility cycling this will scarcely be noticeable, much less an issue. There may be some differences in ride quality over rough pavement, but honestly those are hard to quantify. The primary issue is rebound. A pneumatic tire acts like a spring. It compresses over a bump and rebounds, with little loss in energy. An airless tire has higher losses. Therefore, the speed decrease is worse over rough pavement. However, high-rebound elastomer, if available, minimizes this. But if you have mostly smooth roads, the speed losses with decent airless tires are pretty minimal. Even over rough roads, they’re not horrible if you have a decent tire. Airless tire research is ongoing. I’m going to say they’re very close to getting to the point where they’re good enough for common use, if not there already. It might take a few more years before they’re accepted on the racing circuit. Whatever trade-offs may exist for the utility or recreational cyclist, I’d say they’re worth it. Peace of mind is one benefit. Another is knowing you won’t have a (possibly fatal) blowout of your front tire during a high-speed descent. You can barely order coffee in Sunnyside without three ppl hearing about it. A name will come forward eventually. Actually there are many exceptions to the law. You can ride outside of a lane for a block if you are preparing to make a turn off a bike lane. You can certainly ride outside a bike lane if there is an obstruction. You can also ride outside of a bike lane if you feel your safety is endangered as well. However, that one seems to be that you would have to prove your case to the cop going to write the ticket or in front of the judge if you challenge the ticket. I heartily recommend Continental Gatorskin tires, inflated to near max pressure. 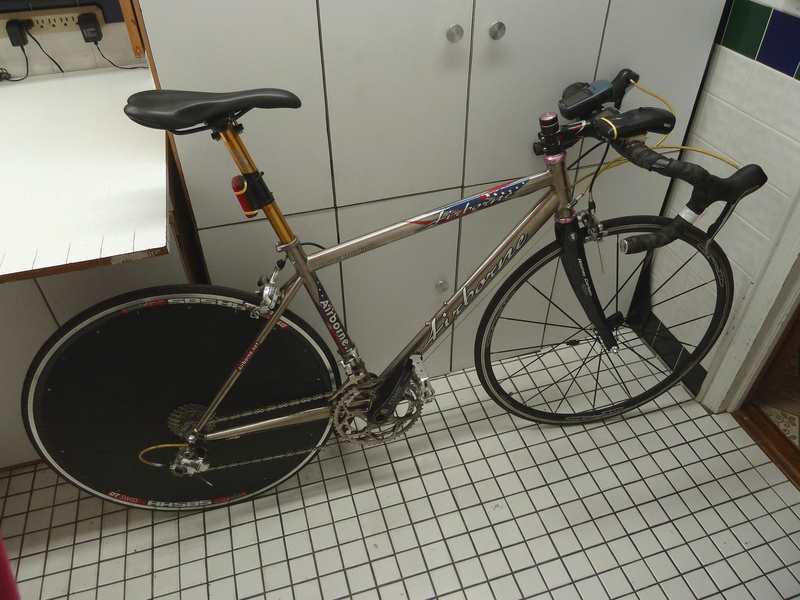 I ride at a taut 120 psi myself. Break nails with these things! Come to think of it I haven’t had a puncture flat in a couple years now. At this point I’m pretty invested in airless but those might be a good recommendation for someone on the fence. Freedom from having to occasionally top off the tires is another reason I went airless. That and fixing flats constituted 95% of my bike maintenance. Now I just occasionally oil the chain, even more occasionally replace it, or the rear cassette, and once in a while fix a broken spoke. That’s probably a stretch but I can see how this might qualify as low-level terrorism. Not terrorism. Please, stop and think before you use that kind of rhetoric. We have seen real terrorism on bike routes (the Islamic terrorist who ran down those unfortunate tourists on the Hudson River Greenway last year). Whoever did this is a criminal, a vandal, a sociopath, and someone who generally makes my blood boil. But not a terrorist. That kind of language makes us (safe streets advocates) look like fools, and it reminds me of those “If I can’t do X, then the terrorists have won” remarks that made people look stupid in 2002. Plus, if the NYPD thinks there are terrorists attacking this bike lane, they’re going to install bollards to make it useless for cyclists. @snrvlakk – It’s not pretty much the same thing, it’s more workable thanks to the efforts of the late Steve Faust. Steve’s expert testimony in the Republican National Convention arrests and in the NYPD crackdown on bicycling afterwards led to the dismissal of literally hundreds of bike lane citations. But the NYPD still uses inapplicable laws and a false reading of the RCNY to harass people riding outside of bike lanes. Can you share your definition of terrorism? I can think of plenty, but I can’t think of one that would include “throwing some tacks on a bike lane I don’t like”. Vandalism? Definitely. But terrorism? Nope. Umm….thumbtacks are not terrorism. Now, if that is the litmus test you want to use, the overuse of cars in the city are instruments of terroism. People are actually dying and actually losing lose of limbs. Children are dying. Let’s talk about this terrorism. Not to mention the health effects. There is no way that tacks are terrorism. Ever. I regard this as a criminal act and we have asked the 108th Precinct to investigate it as such. If we assume that the attacker wanted to cause injury, then this act meets most definitions of terrorism. Tell that to the dozens of victims of the Manchester bomber who were killed by tacks. Wow George, triggered much? So by that argument, is your local supermarket an arms draler? Do they need a class 3 license to sell thumb tacks? Yup, judging by both of our responses I’m the one who is triggered. We accept that car attacks, knife attacks, acid attacks, and bombings can all be terror attacks and people who sell Fords, cleavers, car batteries, and pressure cookers don’t have to have a class 3 license. Just accept that you were wrong and incredibly insensitive towards victims of previous attacks. Most of those definitions also require an act of violence, which this isn’t. And a lot of those definitions are so broad that they’re a lazy prosecutor’s dream. “Sure, let’s charge him with ‘terrorism’, that will make him squirm…” Again, it’s vandalism and being a jerk, but if everything counts as terrorism, then really nothing qualifies as terrorism. I would call this act criminal mischief combined with reckless endangerment, but IANAL. You need to push for tack registration system. Now. Don’t wait.